An all-female doo-wop band whose image is believed to have been the first photo uploaded to the fledgling world wide web is to play its final gig. Les Horribles Cernettes take their swansong at the Hardronic Festival at the Cern laboratory in Geneva - the birthplace of the web. A picture of the women was uploaded to the web on 18 July, 1992, by web creator - and fan - Tim Berners-Lee. 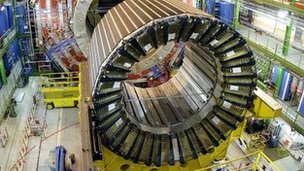 The gig on 21 July at the annual Cern music festival will be their first performance for five years - and is billed as their last. The band was even featured on the US talkshow hosted by Jimmy Kimmel, said Mr Halley. The growing interest has led the Cernettes to post a message on their website explaining their distress at the "press tornado" surrounding them. In particular, they took issue with a report on Motherboard about the circumstances surrounding the use of the image. "This photo was one of those that changed the web, from a platform for physics documentation, to a media for our lives," they said. "It was really one of the first," Mr Halley told the BBC. "Nobody has found anything else loaded before it - put it that way." The picture was taken by Silvano de Gennaro, the husband of founder Michele, during the band's early days when he was trying to spread the word about them. Mr Halley said he was advising the Cernettes to keep on gigging rather than give up on their musical careers. "The whole world has gone nuts for them," he said.